Jokes And The Pain That Fuels Them At Montreal's Just For Laughs Comedy Awards Pain has long been at the root of great comedic material, and it was no different at this year's annual Just For Laughs Festival in Montreal. From left, Just For Laughs' new owner Howie Mandel, comedians Tiffany Haddish and Hannah Gadsby. As a gay woman, Gadsby suffered some pretty horrific injustices growing up in a small town in Australia. 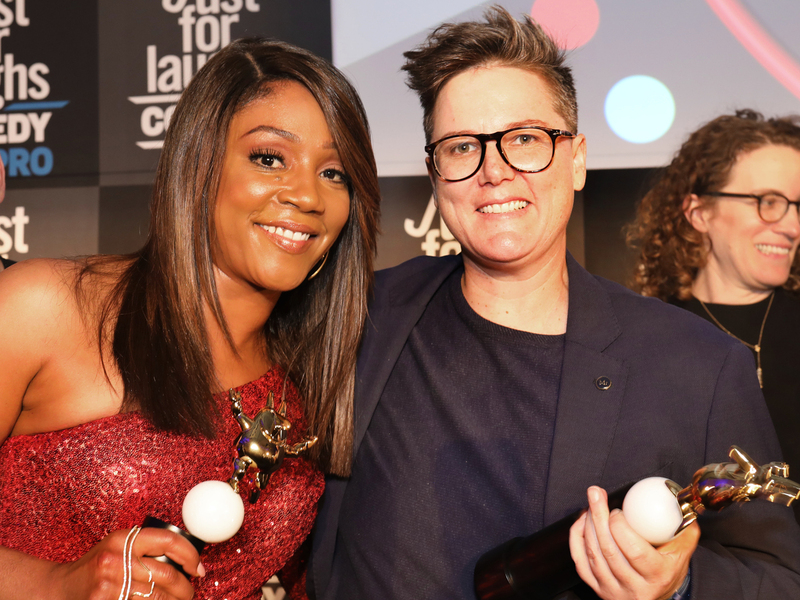 She won an award for her new Netflix special, Nanette, an explosive performance in which she is both hilarious but also gets angry and questions whether she can continue making jokes about the emotional wounds that still run deep. Turns out, she can. While Gadsby claims in the special to be leaving comedy, she's since had a change of heart. She said the response to Nanette has been far more positive than she ever imagined. Just For Laughs – and its French language counterpart, Juste Pour Rire - is the largest comedy festival in the world, according to organizers, who say some two million people are attending this year. Headliners include David Cross, Kevin Hart, Dave Chappelle, Trevor Noah, and in a last minute announcement, Amy Schumer. The festival's annual "New Faces" series is a coveted showcase known for launching future stars. Accepting the award for Break-Out Comedian of the Year, Lil Rel Howery said it was his trip to Montreal for "New Faces Unrepped" back in 2011 where he first met filmmaker Jordan Peele, who ultimately cast him in his Oscar-winning movie Get Out. It takes years to make it as a standup comedian. Aspiring comedians often audition multiple times before they land a spot at the festival. It can also be a challenge to find a live stage to perform on. At the awards show, both Howery and fellow Chicago comedian Deon Cole praised one of the city's longtime club owners, Mary Ella Lindsey, for giving them a place to hone their craft and, said Howery, a place to audition for Just For Laughs. 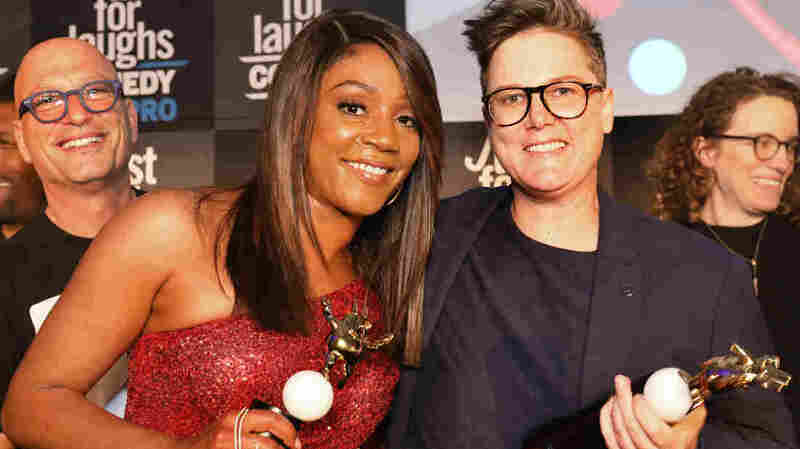 "Joy is better than crack," beamed Tiffany Haddish as she accepted the Just For Laughs Award for Comedy Person of the Year. With her breakout performance in Girls Trip, her debut comedy special, best-selling memoir The Last Black Unicorn, and becoming the first African-American woman stand-up comedian to host SNL, Haddish is unstoppable. Her new goal: Owning her own studio. "Be the boss," she declared. Haddish, who grew up in foster care, got emotional as she thanked the many comedians in the room who loaned her money when she was too broke to even buy a hot dog. She said the one person she most wanted to please was her mother. When Haddish was a little girl, her mother was in a car accident that left her with a brain injury that caused her to be abusive. "For a long time, I thought my mom didn't like me," Haddish told the audience. Once she started making money, Haddish said she fulfilled one of her dreams: getting her mother out of a mental institution. Through tears, Haddish said her mother told her how proud she was when she learned she was receiving the Just For Laughs honor. Awards were also presented to Jo Koy (Stand-up Comedian of the Year) and the co-creators of GLOW, the Netflix series inspired by the 1980s, professional women's wrestling show of the same name. Liz Flahive and Carly Mensch (Comedy Writers of the Year) explained how they make GLOW's largely female cast feel comfortable wearing leotards and performing physically awkward and challenging positions in the ring. The actresses are "surrounded by tons of great women," said Flahive, referring to the crew, "and a few good men." They told the audience that GLOW's storylines of the sexual harassment and discrimination these women faced resonate today, and that they fully support the #MeToo movement. "We're proud to be part of that roar," said Mensch.